Everything in the Universe follows a blueprint or pattern. Aspects of our natural world, which may seem obscure and different from one another, are often shown to share common and basic patterns, e.g. clouds, flowers, crystals and even human DNA. But it is not just in our visible world that these patterns apply. There are many congruities between the patterns of nature, art, music and healing. Generally speaking, what we perceive to be beautiful and pleasing to the senses is so because of this patterning, e.g. the ratio of features on the human face and body, the leaves on a plant, and the rhythms and timings of a piece of classical music. This is the architecture of the Universe. Often something that we perceive to be random and yet beautiful is following an extremely complex set of fundamental rules that, from the smallest molecule to the largest planet, shape the reality we live in. From the rhythms of our bodily systems to the movement of the celestial bodies there is a pattern that is instinctual and naturally balanced. ?It is commonly said that when we are in balance with the forces of the Universe that we are in a state of flow or abundance, and it is then that we come to the realisation that we are part of the whole, and that it is very much a part of us. Hermitic monks spending weeks in deep contemplation and meditation have often been able to explain what science is now only starting to, as they truly allow themselves to merge with and thereby know the unspoken silent forces of this Divine matrix. The human brain is very advanced and often we follow our brain ahead of our instinct. Although we are very good at intellectualising how our Universe works, we don’t really fully understand every aspect of it, and so, by not listening to our inner voice or gut instinct we can often find ourselves struggling against this relentless force. This is when we start to experience pain and dis-ease. In order to be fulfilled, a connection with the underlying patterns of the Universe needs to be re-established and fortified within our hearts. 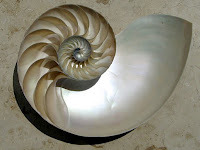 There are many different types of geometry that make up the world around us including sacred geometry, the three-dimensional platonic solids, the hyperbolic geometry of sea slugs and coral, fractal geometry, geometry in art and symbolism (phi/the golden ratio/the Fibonacci sequence), the geometry of sound and music, and the geometry of crystals. What I love about this particular field of study is that it appeals to both the left and right side of the brain and that it can be viewed as science or art. To say that everything in this life and reality is based on math may seem dull to some, but to me I feel it is a majestic and exciting prospect. It doesn’t make something less beautiful or fascinating if you know its origins, sometimes it can make something even more magnificent. The Greek philosopher Pythagoras was one of the first known to discover congruities and mathematical symmetries between art, music and nature. On further investigation he discovered three of the main shapes in matter: the tetrahedron, the hexahedron and the dodecahedron. What these three dimensional shapes have in common is that they are all made up of equilateral, equiangular polygons, which means that all the faces of these objects had the same number of bounding lines of equal length and of equal angles. It was years later that a student of Plato, named Theaetetus discovered two additional shapes: the octahedron and the icosahedron. These five shapes are collectively known as “the Platonic Solids” and it is understood that they are the basic structures of matter and form. These perfect shapes are even visible in nature from the dodecahedrons of garnet and human DNA (see excerpt below) to hexahedrons of pyrite. When viruses are examined under a microscope their structures also mirror the shapes of the platonic solids. It is now widely believed that the very Universe we live in is shaped like a dodecahedron. Since 1980 a science known as fractal geometry has been made known. A mathematical set known as The Mandelbrot Set gave scientists and mathematicians a function, which could explain the complexities of the formation of clouds, mountains, coastlines and other such seemingly random natural phenomena. It is a pattern, which is infinitely small and infinitely large at the same time, a pattern, which repeats itself and is self-organising, creating the same shape over and over again but to a larger or smaller scale. The pattern is so regular and repeating that scientists have been able to generate very real imagery of mountains and coastlines using only the maths of the Mandelbrot Set. Having studied the patterns the scientists were also able to discern the congruities between the Mandelbrot Set and mandalas, which are based on Sacred Geometry. Although the concept of fractal geometry could only be explained in the 1980’s thanks to the development of computers, it appears to have been something that was in the collective unconscious for a very long time. 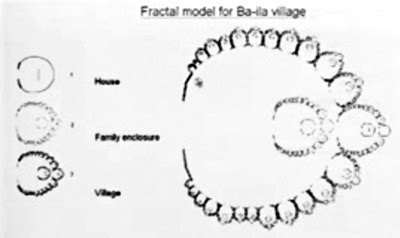 A mathematician named Ron Eglash stumbled upon the fractal patterns in the layout of indigenous African villages and buildings relatively recently which led him to travel there to investigate further. When he pressed the people for an algorithm, which helped them to build in such a way and paint images that were of a fractal nature they merely told him that it felt right. It is as if the knowledge of fractals is innate to our very being. We now know that even our lungs are fractal. If you take a look at where your thumb meets the palm of your hand, in the wrinkles you see there a repeating pattern will become apparent. This is another example of fractal geometry. Fractal Geometry makes up the very clouds in the sky to the leaves on a plant and a corresponding mathematical function can be written to generate them. The image below is the layout of a village in Africa and it is apparent how it resembles the Mandelbrot Set itself. The way gas moves, the way cancer and the aids virus develop, the way our bones fracture and the way our hearts beat are all based on fractal geometry and can be mapped out using mathematical functions. Sacred Geometry is known as ‘nature’s first pattern’. It is based on a pattern of interlocking circles of equal radius. The first pattern in sacred geometry is formed with two interlocking circles and creates the ‘Vesica Piscis’. This shape is very symbolic and mirrors exponentially in the sacred geometric patterns that follow. The Vesica Piscis is shaped like the human eye and some people correlate it to the all-seeing eye of Horus. The Vesica Piscis can be literally seen in many areas of our visible reality, the human eye for example, the petal of a flower and even some star nebulae e.g. 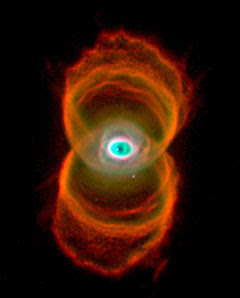 the hourglass nebula. Another well-known shape that derives from this concept of interlocking circles is “The Tripod of Life” (a.k.a. Borromean Rings). It is formed when a third circle is added to the Vesica Piscis. This is a symbol which can be seen engraved in many sacred places and can represent: mind, body and spirit; The Holy Trinity – father, son, and holy spirit or The Triple Goddess – crone, mother and maiden. It is a pattern often seen in Celtic art and it is where the Wiccan Triple Moon symbol has its origins. As the sacred geometry pattern expands and reiterates it forms concentric circles (other examples of concentric circles in nature include, the rings of a tree, the rings around Saturn, the orbits of the planets, and the waves that are created when a stone is dropped into a still pond). At each concentric circle in the pattern of sacred geometry a new formation occurs which holds deep spiritual meaning and also encompasses the patterns and meanings of the preceding patterns. Based on this theory, the next formation that stems from the Vesica Piscis in the pattern of sacred geometry is known as “The Germ of Life”. “The Germ of Life” encompasses the six-pointed star, the hexagon, the Star of David, and even the peace sign. “The Seed of Life” (the second concentric circle in the pattern) encompasses the Yin-Yang symbol, the Kabbalah tree of life. This tree of life is also mirrored in the grid lines layout that we use in crystal healing, incorporating the active line, initiation line, power line, and integration/manifestation line. “The Fruit of Life” (fourth concentric circle) – encompasses the Tetractys (which is a triangle pattern that consists of ten points arranged in four rows). 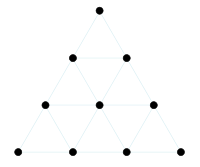 The Tetractys is a very important and worshipped symbol of the Pythagoreans. It is also said to correlate to the Kabbalistic Tree of Life. The Tetractys pattern is also apparent in tarot card layouts. Although the ‘Fruit of Life’ pattern itself is two-dimensional it indicates and hints at the three-dimensional platonic solids. This sacred pattern along with the apparent three-dimensional representations of the platonic solids is known as Metatron’s Cube. On viewing them it becomes apparent that these patterns are the ones used in many religious and spiritual mandalas which people meditate upon to gain greater insight, awareness and understanding into life. There have also been many incidences of crop circles around the world that mirror these patterns. It is believed to be a communication of some sort. Glyphs, again mirroring these patterns, have been found around the world in between layers of ice in frozen lakes and rivers, sand dunes, and engraved in ancient architecture and people have no explanation as to how they were created. The sacred geometry pattern is infinite in size in that it can be repeated both microcosmically and macrocosmically which is reminiscent of the root principles of creation itself. In art, many architects, especially in ancient times, have based their structures on this Fibonacci sequence such as the Parthenon and the Acropolis in Athens. More famously the Fibonacci sequence was incorporated into Leonardo Da Vinci’s Vitruvian man. The human body is divisible in many ways by this golden ratio (a.k.a. Phi) in the way that the phalanges of the fingers are divided and compared with the hand itself and then the arm itself and so on and so forth. The Fibonacci series can even be seen in human DNA. I don’t think it’s any surprise to know that there are maths in music. The repeating sounds and patterns within the rhythms are apparent. Harmonies and octaves in music are all based on a number known as “the perfect fifth” which is the space between a note and the note seven semitones above it on the musical scale. Also, I’m sure you’ll agree that music can take you to many places mentally, emotionally and spiritually. Some songs are naturally soothing and relaxing, some (like heavy metal music) can help with the expression of anger and frustration, some can make you feel uplifted and others can stir memories which again can bring about a plethora of emotion in an individual. Many cultures across the globe have their own tribal sounds and rhythms, from the tribal drumming in Africa, to traditional Irish music to the panpipes of South America, the sounds of silk and bamboo in China, Gregorian chanting, and the sounds of the didgeridoo used by the aborigines. These sounds are sacred to many and they are used in ceremonies to help connect with spirit and create greater self-awareness and insight. Natural sounds and music are often included in meditation tapes. These include rain, the ocean tides, a gentle wind, ambient forest noises and whale song. I lately came across some imagery that was derived through an application designed to convert sound to image using a process known as ‘cymatics’. The sound in question was whale and dolphin music. The images are amazing. The resemblance to the sacred geometry patterns is uncanny. The inner geometry of crystals is structured and uniform. It is because of this beautiful symmetry that crystals are so well able to reflect, hold and refract light. There are seven main geometric shapes or systems that crystal structures adhere to. These are namely, cubic, tetragonal, orthorhombic, monoclinic, triclinic, trigonal, and hexagonal. Water itself is not considered to be a mineral (crystal) until it is frozen as ice. This is because unlike water, ice has a regular repeating inner lattice, which qualifies it as a mineral or crystal. Having this inner regular lattice causes ice to form beautiful crystals resembling snowflakes. Dr. Masaru Emoto has done studies into the healing powers of prayers and intention utilizing this crystallization process. People sit with some water and instill the qualities of a certain emotion through the power of prayer and intention and then the water is frozen and studied through a microscope. The results were phenomenal. Where the intention was pure and thoughts were strong and focused, the results yielded a beautifully symmetrical crystal, however in the presence of blasphemy or an intention of war etc. the crystals that grew were distorted and blurry. The above text is merely an overview of the different types of geometry that make up the Universe we live in. Learning how to become attuned to this language we can learn to become balanced and connected. Here is an amazing animation I came across on You Tube that illustrates the beauty in the maths of nature. An interesting talk by Benoit Mandelbrot, the pioneer of fractal geometry, about fractals and the art of roughness. Hey superb blog! Does running a blog such as this take a lot of work? I have absolutely no knowledge of programming but I had been hoping to start my own blog in the near future. share. I understand this is off subject nevertheless I simply had to ask. Hi there! I’m at work browsing your blog from my new iphone 3gs! I in finding this matter to be really something that I feel I might by no means understand. taking a look ahead in your next put up, I’ll try to get the grasp of it! I don’t know why I cannot join it. Is there anyone else having the same RSS issues? me. I am taking a look forward on your next post, I’ll attempt to get the grasp of it! was inspiring. Keep on posting! I wanted to thank yyou for this very good read!! the viewers to go to see the site, that’s what this website is providing. Goo? da?! Would you mind ?f ? share y?ur blog witrh my zynga ?roup? Th??e’s ? lot of people t? ?t I think ?ould reall? enjoy ?ou? content. website. I’m hoping to check out the same high-grade content by you later on as well. of the Universe | Muladhara <Liked it! This piece of writing is really a fastidious one it helps new the web visitors, who are wishing in favor of blogging. The clarity for your put up is just cool and i could assume you’re an expert in this subject. coming near near post. Thanks 1,000,000 and please keep up the gratifying work. Thankfulness to my father who shared with me on the topic of this web site, this blog is truly remarkable. Hi there it’s me, I am also visiting this website daily, this website is actually pleasant and the people are truly sharing nice thoughts. Thank you for sharing your thoughts. I truly appreciate your efforts and I am waiting for your next post thank you once again. Hi there to all, how is everything, I think every one is getting more from this web page, and your views are pleasant in favor of new people. of msn. That is an extremely neatly written article. I will be sure to bookmark it and come back to read more of your useful info.